Just for funsies, I made banana fritters. I had most of a bunch of bananas that I bought for the bout last week, and of course they bruised in transit and of course I am a banana princess... which doesn't sound quite right, but onward, I can only eat perfectly yellow bananas. So I've had these four bananas blackening on the counter all week, I know I'm not doing smoothies again until June probably and you know I'm not going to bake, viz., banana bread. So I'm sorry to say, I'm not above throwing out food. I don't force myself to eat things. Just out of curiosity though, I googled "how to use up bananas" and let me tell you something, if you're going to write an article called 17 Delicious Ways to Use Up Old Bananas, I feel like you shouldn't come at me with banana bread and smoothies, I already knew about those! And let's talk about this three layer caramel banana cake, man, I am the person who just watched as the life force drained out of four perfectly good bananas, do I look like I have the get up and go to assemble a cake that needs three cake pans to come together? But then again I'm given to understand that this is how other people feel about me and my li'l ol' blog, which is why I'm always saying YMMV and really mean it. Also that banana "soft serve" is gross. Oh right, but, I was intrigued by these banana fritters. Something that could use up all your old bananas, that you could whip together without too much fuss or too many additional ingredients. I mean, meh, it uses flour, so I wouldn't eat these every day. I pretty much stuck to the linked recipe, except I think bananas are sweet enough so I left out the added sugar, yup, YMMV. I've been using up this bag of cake flour so I used that, but otherwise all purpose flour. And I'm using up this vegetable oil and after that's gone, I'm going to use coconut oil for frying and that would probably be reeeally good for this. Also this is a pretty scalable recipe, per banana: a dash of nutmeg and cinnamon, a drop of vanilla, a pinch of salt, and 1/4 cup flour. Probably you could just eyeball it all. And actually 1-2 bananas is a more edible amount, four bananas makes twelve fritters and they're so rich I could only put down two. Mash bananas with a fork or potato masher, and stir in spices and flour. Heat enough oil to cover the bottom of a heavy pan over medium high heat. 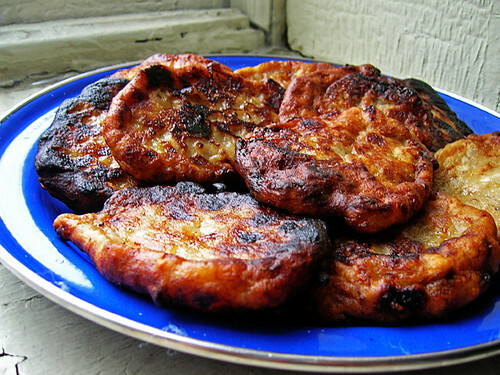 Same as with mung bean pancakes, I put a drop of batter in the oil and when it sizzles, the oil is hot enough. Drop large spoonfuls of batter into the hot oil and pat to flatten them a bit, fry for a couple minutes on each side, and remove to paper towels to drain.